Coverage of a relatively short time span was one of the advantages William's 'History' held over its contemporaries, which usually began with the Creation or the early, mythic British kings. 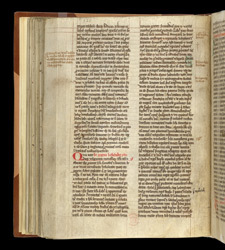 On this page he gives an account of the founding of the Cistercian monastery of Rievaulx, by a mission sent by Bernard of Clarvaux and on land given by Walter Espec. This is followed by the founding of Byland (Belleland) abbey. The note in the margin gives dates (1132-1134) for the early days of Rievaulx.